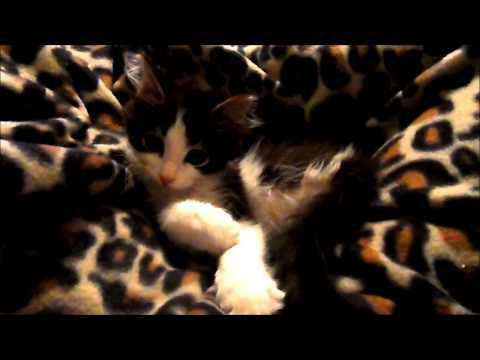 Two legged miracle kitten Anakin gives himself a little kitty bath and plays with his tail while snuggled into a blanket on Mom’s lap. Petmom Carrie Hawks says: Anakin taking a bath & fighting with his tail. This happens nightly now. Ani curls up in my lap to watch TV, takes his bath & then falls asleep. Ani is a two legged cat, born without a pelvis or back legs but that doesn’t stop him. He is full of love & life! For more about Anakin’s story, and videos, click HERE.